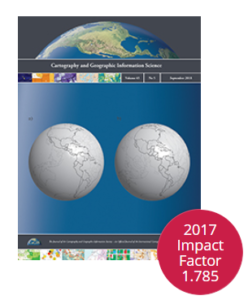 Cartography and Geographic Information Science (CaGIS) is the official publication of the Cartography and Geographic Information Society. The Cartography and Geographic Information Society supports research, education, and practices that improve the understanding, creation, analysis, and use of maps and geographic information. The society serves as a forum for the exchange of original concepts, techniques, approaches, and experiences by those who design, implement, and use geospatial technologies through the publication of authoritative articles and international papers. The role of the CaGIS journal is to facilitate these objectives by disseminating results and reports in these areas of interest. In 2004, CaGIS became one of the three official journals of the International Cartographic Association (ICA). This distinction has allowed the Journal to expand its reach worldwide, with the benefits of including international submissions and inviting international participation in the editorial and review process of submissions to the International Cartographic Conference. The CaGIS journal is the home of the U.S. National Report to the ICA. Members of CaGIS have full access to the journal by logging in. The Editor of CaGIS is Dr. Nicholas R. Chrisman supported by an International Editorial Board. Dr. Thomas W. Hodler (University of Georgia) is the Cartographic Editor.